Sheppard was born in Morris County in east Texas, the oldest of seven children, to lawyer John Levi Sheppard, later a judge and United States Representative; and his wife, the former Margaret Alice Eddins. Through his mother Margaret, Morris was a direct descendant of Robert Morris (1734–1806) of Philadelphia, Pennsylvania, a financier who had signed the Declaration of Independence, the Articles of Confederation, and the United States Constitution. Sheppard received his B.A. degree from the University of Texas at Austin in 1895, and an LL.B. from the University of Texas School of Law in 1897. While in law school Sheppard became a member of the Methodist Church, and became friendly with two classmates, future Governor Pat Neff, and future U.S. Senator Tom Connally. In 1898, he received his LL.M. from Yale Law School. He began practicing law with his father in Pittsburg, Texas and later Texarkana. In 1902, Morris Sheppard was elected as a Democrat to replace his deceased father in the United States House of Representatives. He held the seat until his resignation in 1913, when the Texas legislature elected him to the United States Senate. He served as Democratic whip between 1929 and 1933. In the 1928 presidential election, Texas voters abandoned the Democratic candidate, Alfred E. Smith, Governor of New York and a Catholic, carrying the state for Republican Herbert Hoover and contributing to his victory. In the summer of 1929, the First Lady Lou Hoover arranged the traditional teas for wives of congressmen, inviting Jessie De Priest, wife of Oscar Stanton De Priest of Chicago, the first African American elected to Congress in the 20th century. Senator Sheppard was among those who objected to this invitation, quoted as saying, "I regret the incident beyond measure. It is recognition of social equality between the white and black races and is fraught with infinite danger to our white civilization." Sheppard held his Senate seat until his death in Washington, D.C. in 1941. Then-Representative Lyndon B. Johnson ran for Sheppard's Senate seat in the 1941 special election, and lost to Governor W. Lee O'Daniel. 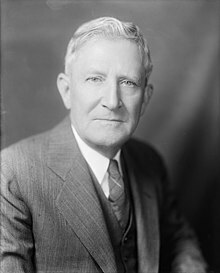 As Senator, Sheppard sponsored progressive reform legislation promoting rural credit programs, child labor laws, and antitrust laws. He was also an advocate of Women's suffrage in the United States. But he supported the maintenance in Texas and the South of racial segregation in public facilities and the disenfranchisement of blacks. During his tenure, Sheppard was a vocal supporter of the temperance movement. He helped write the Webb–Kenyon Act (1913) to regulate the interstate shipment of alcoholic beverages, authored the Sheppard Bone-Dry Act (1916) to impose prohibition on the District of Columbia, introduced the Senate resolution for the Eighteenth Amendment establishing national prohibition, and helped write the Volstead Act which provided for its enforcement. However, during the Prohibition era, a still that produced 130 gallons of moonshine per day was discovered on a Texas ranch that Sheppard owned. When a resolution calling for a Twenty-first Amendment to repeal prohibition was introduced to the Senate by John J. Blaine, Sheppard filibustered it for eight-and-a-half hours. He was not helped by a single Dry Senator and he relented, the motion passing by 63 votes to 23. Co-sponsored by Morris Sheppard and Horace Mann Towner, the Sheppard–Towner Act of 1921 provided Federal matching funds for services aimed to reduce maternal and infant mortality. The funding included: midwife training; visiting nurses for pregnant women and new mothers; distribution of nutrition and hygiene information; health clinics, doctors and nurses, for pregnant women, mothers and children. Senator Morris Sheppard and Congressman Wright Patman are considered the fathers of the Federal Credit Union Act of 1934. Sheppard was the act's author. The bill had stalled in the United States House of Representatives considerably shortening the time the Senate had to pass the final version. Rather than sending the bill to a Conference Committee, Sheppard asked the United States Senate to pass the bill unanimously without reading the bill or the amendments. The bill passed the Senate unanimously. The Morris Sheppard Credit Union in Texarkana, Texas carries the Senator's name, while the institution's local credit union chapter is named after Congressman Patman. On December 1, 1909, Sheppard married Lucile Sanderson. The couple had three daughters: Susan, Lucile, and Janet. Some of their descendants also became politicians. Sheppard and his wife were the grandparents of Connie Mack, III, Republican U.S. Senator from Florida, and great-grandparents of Connie Mack IV, Republican U.S. Representative from Florida. Other Sheppard grandsons were Democrat Richard Sheppard Arnold (1936–2004) and Republican Morris Sheppard "Buzz" Arnold (born 1941), judges at different times on the United States District Court for the Western District of Arkansas, and later concurrently on the United States Court of Appeals for the Eighth Circuit, the only brothers to serve concurrently on a US federal court of appeals. The federal courthouse in Little Rock is named in Judge Richard Arnold's honor. Judge Morris Arnold, a Republican, remains on the United States Court of Appeals for the Eighth Circuit under senior status. Sheppard died in office of a brain hemorrhage on April 9, 1941. He is interred at Hillcrest Cemetery in Texarkana, Texas. The year following Sheppard's death, his widow Lucile Sanderson Sheppard married Tom Connally, also a United States Senator from Texas. Senator Connally also pre-deceased Lucile. When she died in 1980, she was buried with her first husband Morris Sheppard in Hillcrest Cemetery. ^ Brown, Norman D. (1984). Hood, bonnet, and little brown jug: Texas politics, 1921–1928. Texas A&M University Press. p. 226. ISBN 0-89096-157-3. Retrieved October 17, 2011. ^ Blodgett, Dorothy, Terrell Blodgett, and David L. Scott (2007). The Land, the Law, and the Lord: The Life of Pat Neff. Home Place Publishers Publishing. p. 19. ISBN 978-0-9761152-2-9. ^ a b Guttery, Ben (2008). Representing Texas: a Comprehensive History of U.S. and Confederate Senators and Representatives from Texas. BookSurge Publishing. p. 138. ISBN 978-1-4196-7884-4. ^ From Ken Burns's documentary Prohibition (2004), episode 2 ("A Nation of Scofflaws"), circa 1:16:00. ^ From Ken Burns's documentary Prohibition, episode 3 ("A Nation of Hypocrites"), circa 1:30:00. ^ "Sheppard-Towner Maternity And Infancy Protection Act – 42 Stat. 224 (1921)". Retrieved 17 July 2010. ^ "Federal CU Act Passes: 1934". Credit Union Magazine. Credit Union National Association Inc (18 Nov 2008). ^ "History-Morris Sheppard Texarkana Federal Credit". Retrieved 17 July 2010. ^ "Grave of Morris Sheppard". Find a Grave. Retrieved 17 July 2010. ^ "Grave of Lucille Sanderson Sheppard Connally". Find a Grave. Retrieved 17 July 2010. Wikimedia Commons has media related to Morris Sheppard. United States Congress. "Morris Sheppard (id: S000337)". Biographical Directory of the United States Congress. This page was last edited on 15 March 2019, at 17:24 (UTC).